Made by Thrupp Coach & Carriage Builders in London, England, c1830. A small four-wheeled English enclosed carriage drawn by two small horses and capable of seating two people inside and one with the driver. The vehicle is low slung with a panelled boot for the driver in front and a full-panelled straight-fronted or cutaway (coupe) body. It features a single perch undercarriage with regular "C" springs and leather braces on which the body is suspended. At the back of the coach is a luggage rack and a sword case fashioned within the body. This was for weapons which were carried for protection during the early days of long distance travel but was later only ornamental. The timber spoked wheels are staggered and dished with steel tyres. The coach is finished in dark green with cream and yellow striping. The coach was thought to have been used by the merchant and settler, Alexander Berry (1781-1873) and possibly features his coat of arms on the doors. The arms depict a shield with three bells surmounted by two feathers and a crowned fox with the wording "Viberts Qoud Contralisti". Unfortunately this wording appears to be a corrupt form of Latin (Videris Quod Contradicti?). It does not translate from any other common European language. The coach also features a drag-staff which is a straight bar of wood attached to the underpart of the vehicle, which when ascending hills is allowed to drag behind. When the horse stops, it presses against the ground and prevents the vehicle from rolling backwards. The interior of the coach has been severely modified by a restoration some years ago and features a padded seat and interior lining of vinyl material, grey ribbed carpet and fold down steps. The term "chariot" is usually associated with a two wheeled horse drawn vehicle used by the Egyptians, Assyrians, Greeks and Romans in antiquity. The chariot of the seventeenth century, and subsequent was so named because of a fashion then current to apply classical names to objects. The name "chariot" seems to have been applied to the French carosse-coupé, a four wheeled carriage, about the middle of the seventeenth century contemporaneously with the more common use of the vehicle in England. Although derived from the continental carosse-coupé the chariot became associated with the English and was later known variously as the post-chaise or post-chariot in England; the Englischer Reise Wagen in Germany and the diligence á l'anglaise in France. The chariot is a member of the coach family but is shorter; a half-coach with seating for two to three on one seat inside. This shortening was achieved by cutting the coach in front of the doors and enclosing the front with a solid panel below and window or windows above. The chariot was cheaper, far lighter and more manoeuvrable than either the coach or the continental carosse-coupé and became more popular than coaches when seating capacity was not an issue. Chariots became a symbol of wealth and social status. 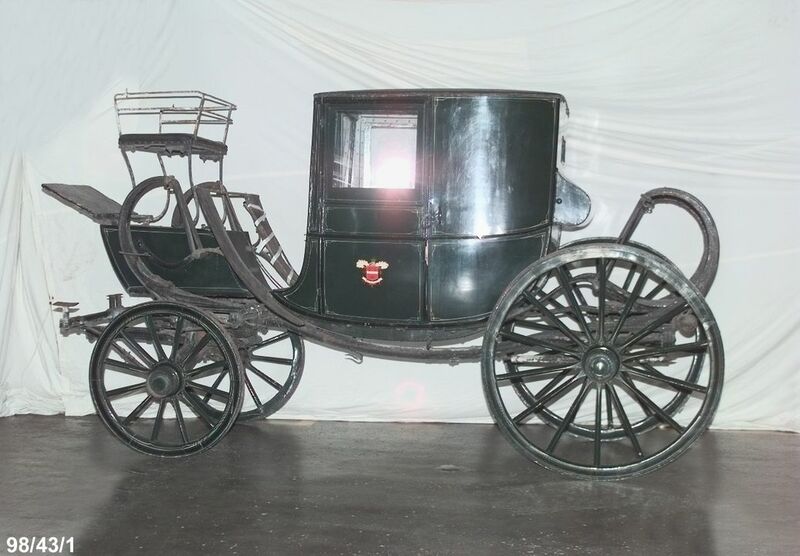 Generally the English chariots had an undercarriage with a single perch and, although 'C' springs were catalogued by London coachmaker A. Webley in 1763 and appear on the Felissent Coupé, dated 1795, in the Museo delle Carrozze at Passariano in Italy, they were not commonly fitted to chariots until the nineteenth century. 'F' and 'S' springs were used generally on the pre-1800 chariots. The front axle of the Museum's chariot carries the impression "THRUPP 1822 B". According to the Rootes Group archives the coachbuilding company of Thrupp and Maberley began in England in 1789 and survives to this day in the Rootes Group, applying trim and finish to convertible and luxury cars. The use of the 'C' springs on the coach places it in the nineteenth rather than the eighteenth century and it is possible that it precedes the manufacture of Thrupp and Maberley's first brougham in 1840. The brougham superseded the chariot although chariots continued to be made, with improvements and modifications until 1890. The "1822" stamped into the coach's front axle may be a manufacturer's date but it may equally be a constructor's number. However, if the chariot was purchased by Alexander Berry for use in Sydney, where he 'retired' about 1836, a date of manufacture about 1830 is considered plausible. The coach is believed to have belonged to the merchant and settler, Alexander Berry. Berry was born in Fife, Scotland in 1781. He was educated at the Universities of St Andrews and Edinburgh where he studied medicine and became a surgeon's mate on an East Indiaman but abandoned medicine in favour of commerce. Wollstonecraft obtained a grant of land on the North Shore where he built Crows Nest Cottage. When Berry arrived from London in 1822 they were granted 10,000 acres of land on the Shoalhaven River where a large estate was developed which they called Coolangatta. Berry's brother, David took charge of the Shoalhaven estate in 1836 and after that date Berry rarely visted the site. After his wife died in 1845 Berry became a recluse in his mansion, Crows Nest House at North Sydney. It is thought that Berry used the coach to travel around North Sydney to visit his friends such as the geologist, the Rev. W.B. Clark, rector of St Thomas' Anglican Church, North Sydney, from 1846-70, and the artist, Conrad Martens of "Rockleigh Grange". The steep hills in the area would have necessitated a drag-staff. Alexander Berry died at Crows Nest House in 1873 at the age of 91. Crows Nest House was inherited by John Hay (later Sir John), Berry's first cousin once-removed, who was a Trustee of the Berry Estates and was born at Coolangatta in 1840. Sir John Hay died in 1892 and the house was then occupied by Lady Hay until her death. The house was demolished to make way for a school, now North Sydney Demonstration School. It is possible the coach stayed in the family during this time but further research is necessary. For many years the coach was on display in the coach-house of Vaucluse House but it is uncertain from where and when it was acquired. While at Vaucluse House the coach was allocated the catalogue No.200. Alexander Berry's coach remained in the Hay family and on 2 May 1932 was placed in the care of the Trustees of Vaucluse House by the Legatees of the Late Sir John Hay. The coach was delivered to Vaucluse House, Olola Avenue, Vaucluse, by the "Pageant Committee". This probably refers to the committee which organised the opening ceremony for the Sydney Harbour Bridge in March 1932 in which the coach may have been involved. The Berry coach was displayed in the coach house at Vaucluse House and acquired by the New South Wales Government prior to 1958. Over the years the coach had fallen into a bad state of repair and in 1961 the Department of Technical Education was approached for assistance with its restoration. This was carried out by the staff and students in the School of Building at Sydney Technical College under the direction of Mr Tom McCotter Snr, who was at that time a lecturer in the College as well as running his own motor body building business at Chippendale. The Motor Body Building Section undertook the renewal of the bodywork. All the exterior panels, which were of cedar, were repaired and broken sections replaced. The door hinges were brazed and the doors fitted and glazed. The front screen and all the missing interior linings and garnish boards were replaced. The inside trimming, which had completely deteriorated through age, was removed by the Motor Trimming section. It was completely removed and replaced with grey Labrex. The exterior hood covering was also replaced with a modern hood topping of black Vynex. The coach was then passed to the Coach and Motor Painting Section for the finishing touches. Before burning off the original paint, a copy of the crest on the coach door was taken and later restored. This is when the apparent error in transcription of the Latin motto most probably occurred. The coach as officially handed back to Vaucluse House at a ceremony on 12 December 1961 with a pair of horses harnessed to the coach, holding a coachman and ladies dressed in period costume. In 1996 the Historic Houses Trust, which now manages Vaucluse House, offered the coach and a number of other items to the museum. As the Historic Houses Trust and the museum are sister institutions within the same ministerial portfolio it was appropriate to transfer the coach with the principal concern being its long term care for the people of New South Wales.